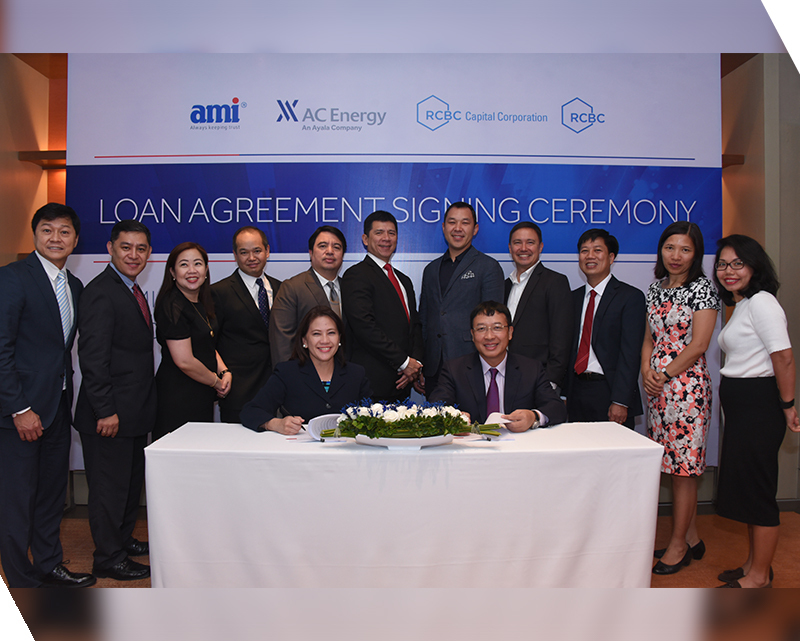 12 October 2018 – AC Energy, a wholly owned subsidiary of Ayala Corporation, in partnership with AMI Renewables Energy Joint Stock Co., signed EPC and financing documents for the development of solar plants in Vietnam. (L-R, seated): Elizabeth Coronel, First Senior Vice President and Head of the Conglomerates and Global Corporate Banking Group, RCBC; Nguyen Nam Thang, Director and CEO, AMI Energy Khanh Hoa Joint Stock Company and New Energy Investments Corporation. (L-R, standing): Arsenio Cruz, Assistant Vice President, RCBC Trust and Investments Group; Ryan Roy Sinaon, Vice President, RCBC Trust and Investments Group; Claudine Del Rosario, First Vice President, RCBC Capital Corporation; Raoul Santos, Senior Vice President, RCBC Trust and Investments Group; Manuel San Diego, First Vice President, RCBC; Jose Luis Gomez, President and Chief Executive Officer, RCBC Capital Corporation; Bolat Duisenov, Director, AMI Energy Khanh Hoa Joint Stock Company and New Energy Investments Corporation; Roman Miguel de Jesus, Director, AC Energy Vietnam Investments Pte Ltd., AMI Energy Khanh Hoa Joint Stock, and New Energy Investments Corporation; Duong Dinh Tich, Shareholder, AMI Energy Khanh Hoa Joint Stock Company, and Chief Accountant, New Energy Investments Corporation; Nguyen Thi Tuyet Mai, CFO, AMI Energy Khanh Hoa Joint Stock Company and New Energy Investments Corporation; Phan Cam Ly, Shareholder, AMI Energy Khanh Hoa Joint Stock Company.